It’s no surprise that the bakery with the most amazing new chocolate-chip cookie in town also makes a solid hot chocolate. The milk is infused with dried lavender, then strained, steamed, and combined with melted dark chocolate. Plus: Maman also sells prepackaged spoons made of chocolate, which melt beautifully into a mug of warm milk. Of course, there’s coffee in this hot chocolate — making it a mocha, technically. Mast Brothers supply the chocolate ganache. Sophia Brittan makes a salted-caramel hot chocolate, using traditional chocolate from Oaxaca, Mexico. It’s hand-frothed with a Mexican molinillo whisk and topped with homemade cajeta and sea salt. Eat a taco while sipping on some Mexican hot chocolate, made with cinnamon, guajillo peppers, vanilla bean, whole milk, and Abuelita Mexican chocolate. Over in Dumbo, there’s a boozy Mexican hot chocolate called Chocolate Caliente. It’s a rich drink infused with spicy dried pequin chiles and spiked with añejo tequila. Pastry chef Jared Rubin makes a classic French drink, Green Chaud (which typically includes hot chocolate and green Chartreuse). His version is composed of a shot of super-rich hot chocolate served alongside a few vehicles for dipping: green Chartreuse gelato, vanilla marshmallows, and a chocolate-chip cookie. This year, Shake Shack’s hot chocolate includes a blend of bittersweet dark chocolates, caramel sauce, sea salt, and milk. It’s exactly what you need after waiting in line, in the freezing cold, just for a perfect burger. You can’t go wrong with bourbon, Mast Brothers chocolate, and salted-caramel ice cream. A wise business strategy at this relatively new version of a Malaysian night market: Give customers a hot drink as soon as they arrive. 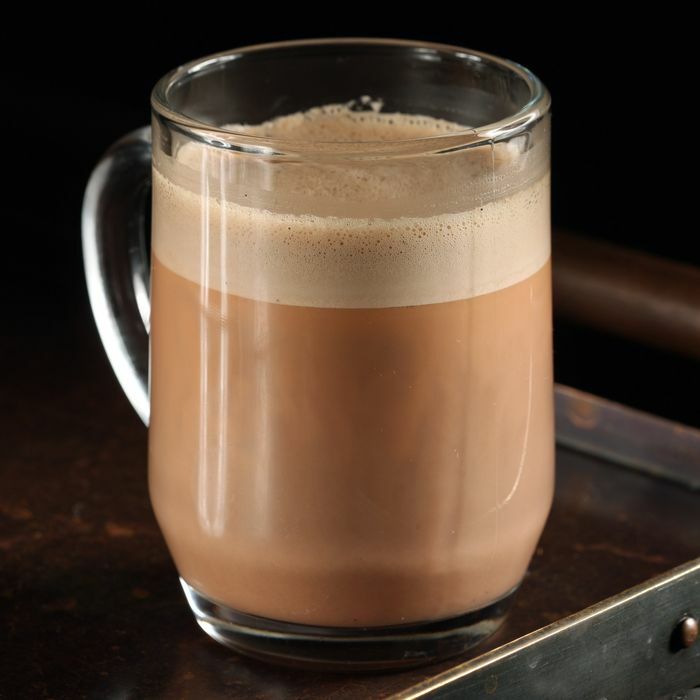 To make this “Pulled Hot Chocolate Tea”: orange-Pekoe tea infused with warm spices, and then drizzled in condensed chocolate milk. You can count on Christina Tosi to make hot chocolate extra rich: She steams classic fudge sauce with organic milk and then blends in charred marshmallows. It’s available at all Milk Bar locations — including the brand-new window on Wooster Street.